For nearly 10 years we have been compiling Force Measurement Data on single and double scullers of various skill levels including some of the top elite scullers in the country and the world to understand how best to improve synergy of power application and in the last few years have been doing the same in our indoor rowing tank with great success. 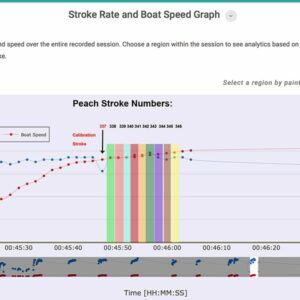 Our new 2017 Peach Force Measurement System can speed up the mastering of efficient rowing technique and synergism. This Force system consists of a portable electronic data logger with force transducers attached to the oarlock pins and the keel of the boat. 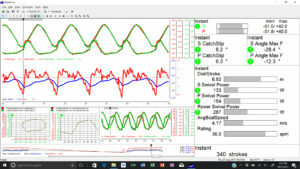 The data logger is downloaded after each on the water session using software that converts the data into force, speed and acceleration curves for each rower, plus oarlock angle, power, stroke, and stopwatch data. The curves and bar graphs are reviewed by the athletes and coach immediately after the outing. We have been using the force measurement system in the boat above for ~ 10 years and in the tank for ~7l years now. We have been using it in the tank with both our Club Members, people taking lessons and with groups renting the facility on weekends. We have used the FM System with everyone from beginners to elite level athletes. 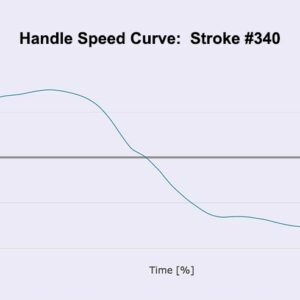 The data allows coaches and athletes to view the force curve, stroke length, slip on each end of the stroke, watts of power produced per side (sculling) or per station (sweep), strokes per minute, handle speed and more. 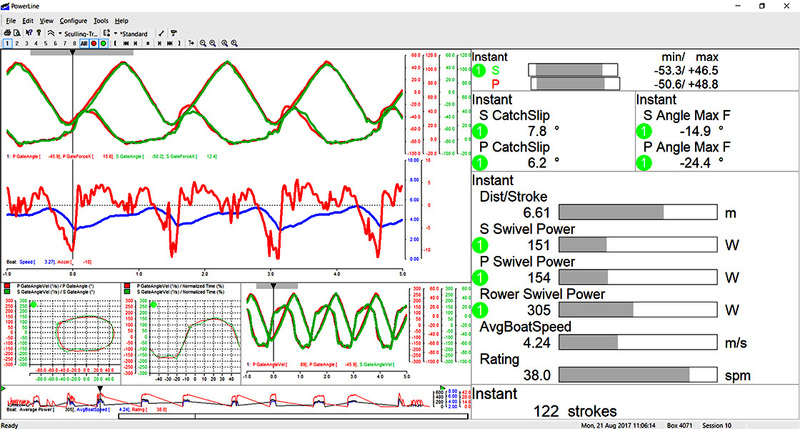 We are offering the Quiske Performance Rowing System for sweep or sculling that provide real-time graphical and numerical feedback in real-time and in a portal subscription web portal for in depth data comparison and review after the fact (see some data screens available – not shown is the seat velocity graph). The below screens taken of single sculler. 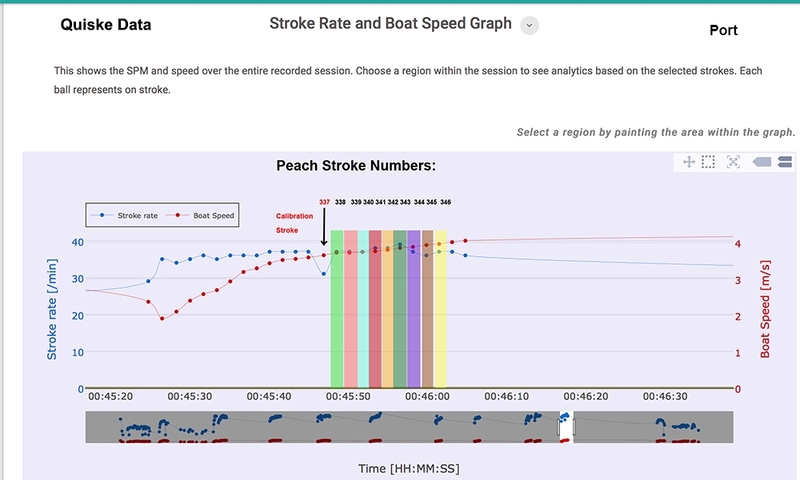 The above Quiske Performance Data (see above strokes 338-346 just stroke 340) compared to Peach Data (see below stroke 340) taken simultaneously for an hour on the water show a strong correlation. 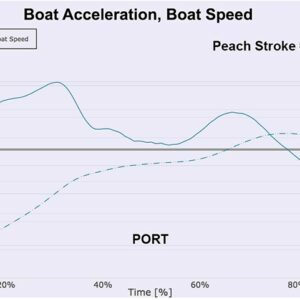 In a larger boat, data can be overlaid between the various people in a boat to make comparisons of synergism and areas that require technical improvement. Different boats can be compared and people within them to determine how to make improvements. See the Quiske Video of RowP App with the Oar and Seat Sensor Pods In Action taken of the USA Jr. 4- with during a training session in July in Princeton. We do offer various Numerical Feedback Devices by NK such as GPS 2 with Training Pack with Heart Rate Belt with EmPower Oar/Scull Lock. We will offer the Smart Oar® system upon request with Dreher Oars. 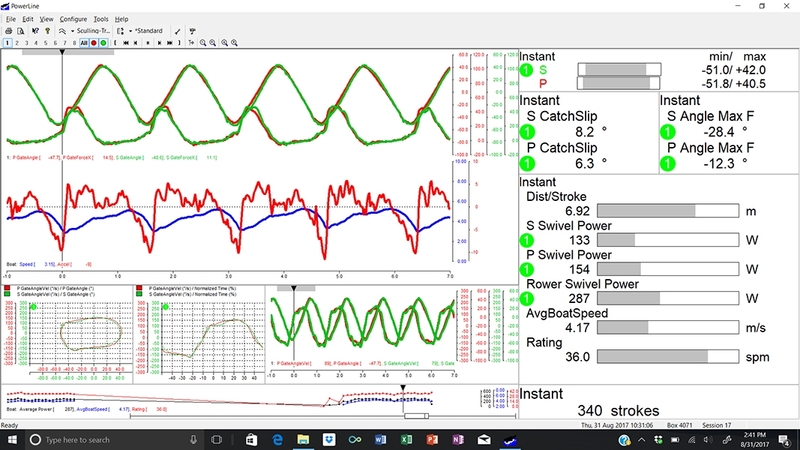 See the data from a session with the Instrumented Dreher Slim Ellipse Smart Oars. Using the generated data, with the assistance of basic physics and biomechanics principles the force, velocity, acceleration and gate angle curves are compared to published curves from the best medal wining boats. 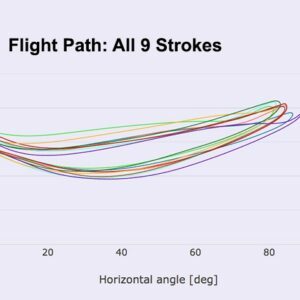 Basic physics confirm why these shapes are good models for an efficient stroke that a coach and athlete can understand.